Back in August 2015, when Diddley was driven to hospital, no one suspected that she would not return to Laurel Cottage. No one except herself, when Bobby overheard her whisper “goodbye”. Over the years I sat with Bobby 2 in the dining room. Not neglected, but not the attention I am getting now. I would watch them cuddling, kissing and dancing to Elvis. Many times she said to him … “I love you Bobby Ballcock. If it all ended tomorrow, no one can take away the fun we have had”. Well, no one can. He has those memories forever. Her ashes on top of Swifts Hill back in the Cotswolds. He looking forward to halcyon days. Writing this blog. And life with the grandchildren. At this point, you might reasonably expect a musical interlude. Predictably “Blue Christmas” by Elvis Presley. But no! Bit miserable. So Bobby has chosen his favourite record of all time. A record that takes him back to the Apex youth club, North Cheam. 1960. An earlier time of optimism. The Girl of my Best Friend …. But, of course, a permanent memorial to those we love and miss is a lovely thing too. Somewhere we can sit quietly and reminisce. For many that is a gravestone. Like many people, Bobby loves old graveyards. But they are full of dead people and Diddley isn’t ready for that yet. So, we will save that for history. Instead we can marvel at those departed a long time ago. Like Ebenezer Scrooge. Who saw his own gravestone in Christmas Future. Here it is. A popular tourist attraction in the lovely town of Shrewsbury. The church of St Chad’s. A rare round church. to find out more about the church and it’s famous gravestone. Time for a favourite Christmas carol. Sung in Diddley’s Gloucestershire. We still needed a memorial. Bobby asked the Rev Virginia, who had officiated at the funeral. Her answer was “Let there be Light“. Latterly the Rev BSA (Barbara) – we have two lady Reverends – told me the expression comes from the Bible. Genesis 1:3. For many years, the village church of St Mary Magdalene has suffered from out of date lighting and maintenance. A decision had been made to set up a fund where people could sponsor lights in memory of loved ones. And so, we joined that fund to raise a considerable amount of money to install a high tech, low maintenance, modern replacement system. Rev BSA even did a marathon run round Lake Galilee to raise funds. The project was finally completed in October. The honour of deciding which one was “Diddley’s” was given to her eldest grandchild Jasmine and her great grandson Jay. Here are some of the family making the occasion even more memorable, by having the church to themselves in darkness. Turning them on, to have Diddley beaming down on us for evermore. Marie played the piano. We all lit candles and Daisy-Mae cartwheeled down the aisle. Family Group: Andrew, Bobby, Jasmine, Marie Giselle, Jay, Daisy-Mae. Sonny and Kyla have now been. 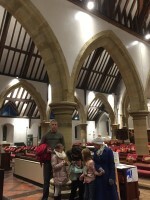 Following a Christmas concert, they are seen with our Reverend ladies. Layla and Amy live further away, but their time will come. Reverend Virginia, Sonny and Kyla – Diddley above. Reverend Virginia, Sonny and Kyla. So the future is for the grandchildren. They love coming to Granny’s house. (It never was Bobby’s). Last Sunday specifically for Sonny and Kyla. The latter already being the main feature of a blog. “Dreaming”. They stayed much of the weekend. Poor old Bobby, tired from a left handed life, left them to their own devices. Their mum, Issy, came later and cooked a delicious roast dinner. After which 7 year old Kyla declared she had been writing stories all day. The modern way. iPad, SIRI to check the spelling (voice activated), and a wi-fi printer. Here is one of her stories exactly as she presented it to Bobby. She tells me she is going to write more stories for the blog. So, we may have a new team member … Junior Writer. … Maybe. Later that evening, Bobby found a scrap of paper behind the computer with a poem on it. Written by Sonny. That too is transcribed below. Making you think twice about condemning the iPad generation. “Out of the darkness into the light”. It’s Christmas. Here’s the Barnsley Nightingale, Kate Rusby singing a Yorkshire carol. Sweet Bells. Hope you like it. We do. At 2 hours 46 minutes in.